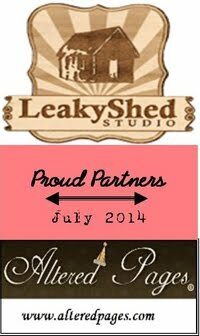 Hi everyone, welcome to the Leaky Shed Studio blog! I recently shared a Julie Nutting Princess Canvas I created using the Princess 8" Doll that I made as a Christmas present for my niece. At that time, I mentioned that I would be sharing a second canvas I made for my other niece. I used many of the same techniques to create this canvas as I did my first one and if you are interested in a detailed tutorial you can visit my blog 17turtles. This canvas was created using the Julie Nutting Classy 8" along with the Ring Frame Large. I once again painted the frame using a Krylon Silver Leafing Pen and then added glitter to the edges for some extra shimmer and bling. I love playing and creating with these dolls, especially the 8" dolls. Because they are larger in size than the 4" dolls, they are a little easier to work with. I once again created a paper pieced dress from patterned paper using the tutorial I have posted on my blog. As I created both of these canvases, it reminded me of how much I used love playing with my dolls when I was a little girl. I think, I still have a bit of that little girl inside me who loves to play with her dolls! It is so much fun to add the little details...all the way down to her silver shoes. I just loveeeeeeeee this so much!! The details on her dress are amazing!!!!!! So gorgeous Juliana!! Love all the details!! Beautiful! This inspires me to get some of these dolls. This is just beautifully done! I have no girls but I still want one of these just for me!!! : ) Great work Juliana! Absolutely adore all this detail - heaven!!! !